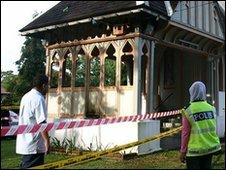 There have been more attacks on churches in Malaysia, in a growing dispute over the use of the word Allah by non-Muslims. The police say petrol bombs were thrown at a church and a convent school in the state of Perak, and at a church in Sarawak on the island of Borneo. Another church in the south of the country was daubed with black paint. The attacks come days after four churches near the capital, Kuala Lumpur, were hit by petrol bombs. Religious tensions in Malaysia have increased since a court ruled last month that a Roman Catholic newspaper could use the word Allah in its Malay-language edition to describe the Christian god. The petrol bomb thrown at a guard house of a Catholic convent school in the town of Taiping, about 300km (185 miles) from Kuala Lumpur, did not explode. Several broken bottles and paint thinners were found at the church next to the convent and one of the country's oldest Anglican churches, All Saints, also in Taiping, Reuters news agency reported. Police and church officials said bricks and stones were thrown at glass windows of the Good Shepherd Catholic church in Miri, a logging and oil town in Sarawak state. Sarawak and neighbouring Sabah state are home to most of Malaysia's Christians, who account for 9.1% of the country's 28 million people. "The situation is under control and the people should not be worried," Home Minister Hishammuddin Hussein was quoted as saying by state news agency Bernama. Correspondents say some of Malaysia's majority Muslim community suspect Christians of wanting to use the word Allah to encourage Muslims to convert to Christianity. The government has appealed against the ruling, in contrast to countries like Indonesia, Egypt and Syria where Christian minorities freely use the Arabic word to refer to God. General secretary of the Council of Churches of Malaysia, Rev Hermen Shastri, said Christians would not be intimidated by the attacks. "We all have to stand together to stamp out terror perpetuated by these extremist groups," he said, according to Associated Press news agency.